Long gone are the cookie-cutter, formulaic kitchens of our parents’ generation. The “work triangle” kitchens, the term given to the three-legged, uninspiring configuration which connected the refrigerator, sink and stovetop, have been replaced by outside the box thinking and original concept designs which add much more personality and functionality to old designs. Fitted VS unfitted cabinets. A fitted kitchen is one in which banks of identical upper and lower cabinets encircle the floor with appliances incorporated into them. In an unfitted kitchen, multiple styles and colours are utilized to create a more personalized feel. Cabinets are more reminiscent of furniture and can be stand-alone, hanging individually off a wall or sit on top of the counter like a hutch. There are endless possibilities, as far as custom cabinetry goes, in terms of design, wood, colour and functionality. Hybrid, wear and tear resistant counter-tops. The counters in a modern kitchen are real workhorses. They are water, scratch and heat resistant, have built in cutting and food preparing areas next to the sink, stove and trash area. They are tools as much as they are surfaces, and aside from being aesthetically appealing, they should be able to stand up to the pressure they are going to be under as you cook. Stainless steel everything. Stainless steel is the best material in the kitchen, period. Stainless steel sinks, refrigerators and ranges are easier to clean and maintain, look nicer and generally tend to hold up under pressure better than their competitors. They do, however, come with a price tag to match. But if you watch top-chef, everything they’re cooking on and preparing with is stainless. Adequate lighting. You can have your entire kitchen on point, stainless steel everything, custom cabinetry all over the place, but if you don’t have enough light to work in, it can quickly become a place that drains the energy out of you, rather than invigorates. Consistent, shadowless illumination for the entire room, as well as fixtures which you can focus and control for specific tasks are key. A mix of fixtures with dimmer controls is ideal. Storage and display. 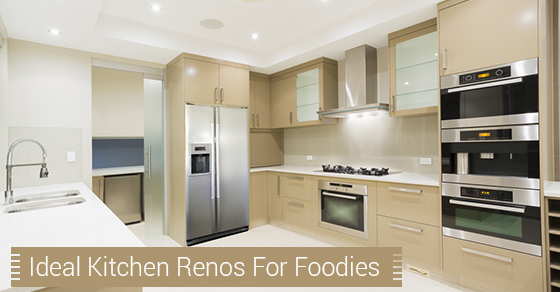 One of the most popular and rustic methods of organizing the modern kitchen is open storage. Drawerless shelves and racks for appliances, walk in pantries – the kind you would find in most restaurants – spice carts, and hanging pots and pans mean no frills, simplicity and that’s what a serious cook needs: quick access and reliable storage. Serious cooking, first and foremost requires serious passion. Without the desire to cook, you can have the best of everything and still feel uninspired. But, if you are serious about food, and a well organized, visually appealing, easy access modern kitchen is something that you need to facilitate that passion, consider the above five modern kitchen re-dos! Contact our team today for more information.